Miracle Car Wash was built in 1979-1980. 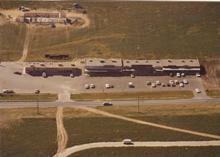 It originally had bay doors and a outdoor wash pad on the West end where the truck bay is today. We just finished full integration of Washcard credit card system. This system adds much more functionality and reliability to our car wash with the ability to pay for your wash with your smartphone using the QR code ready, login and view receipts, and purchase discount wash cards through the web portal. Look for new electronic message boards on the pole sign to be running soon. They are up and in position. Still have electrical and communications to complete. Spring of 2019 estimated completion. We are open to your suggestions on improving the property whether its adding features or functions, appearance, structure, layout, look, asthetics, or anything else you might have in mind, we want to hear from you. Please contact us.